Alastair Cook announced his retirement after the 4th Test against India at the Ageas Bowl, after going through a terrible loss of form. Looking back at his career, it has been an incredible journey from his Test debut at Nagpur to his farewell Test at the Oval! Cook, a thorough gentleman, who carried himself with pride and dignity holds almost all records in English cricket and quite a few world records too. Most number of runs for England in Test cricket, highest number of centuries by an England batsman in Test cricket, most consecutive matches by a player in Test cricket to name a few. But his value to cricket is much more than just numbers. Cook was a typical English player having a dodged defence, endless patience, ability to wear down the bowlers and then capitalise. While these were typical English attributes, what made him unique was his technique and mental toughness. Cook had a very peculiar technique which meant that his trigger movement would take him right back even before the bowler had bowled the ball. While this technique makes a player strong off his back foot, it makes him susceptible against the fuller ball. This is where Cook's mental toughness and endless patience came to the fore. He would continuously leave balls outside his off stump and make bowlers bowl to him i.e his strength, and as mentioned above he was fierce off the back foot. A combination of all these aspects made Cook a great player, not only at home but also overseas. Cook's two career-defining series came against Australia and India in their own background. He scored 766 runs against Australia in the 2010 Ashes, a series very sacred to England and Australia that helped England win the series 3-1. His second career-defining series came against India in 2012 when he was the captain. He scored 562 runs in the four-match series which helped England win the series 2-1. This was the first time England won a series in India since 1984-85. Cook scored three magnificent hundreds in the first three matches of the series on pitches which were turning square. While many Indian batsmen struggled to score runs, Cook put on a masterclass on how to play spin. 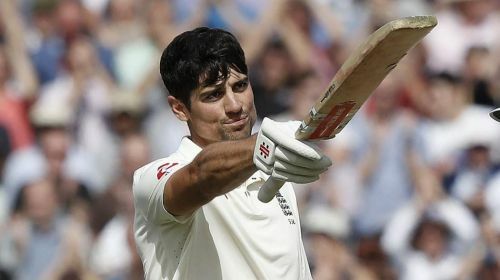 Whoever has followed Cook's journey throughout the years hoped that he would have a fairytale ending to his career, even though runs had eluded him for the most part of the last year and a half. He had a farewell that any sportsmen could only dream of! He scored 71 and 147 in his final match and the ovation he got after completing his century nearly brought tears to his eyes. It showed how much England and world cricket cherished him. Cook, one of the all-time greats truly deserved it.